What should be wished for? Are we now freer or more regimented than ever before? What lies ahead, apotheosis or armageddon? 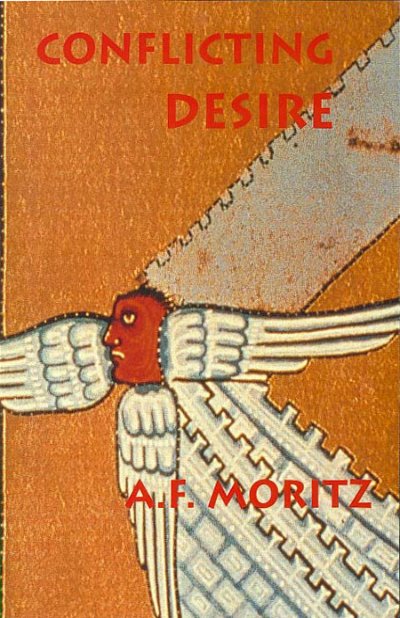 In sharply-etched poems that blend realism and surrealism, A. F. Moritz’s Conflicting Desire traces a visionary tour through the major sites of human fear and aspiration, hope and suspicion. At the same time, the poems return to the things of the earth and the basic richness of living as a constantly available source of pleasure and renewal. Conflicted desire becomes, in this poetic alchemy, a source of freedom as well as dread. This title is on the backlist at Ekstasis Editions. The author also has a select number of copies of this title for sale. Please email roseanne (dot) carrara (at) gmail (dot) com for more information or to arrange a purchase.